This entry was posted in Gardening Tips, Organic Gardening, Tools for the Organic Gardener and tagged how to grow zucchini, organic, organic gardening, squash beetles, summer squash, Yellow crookneck squash, Zucchini, zukes. Bookmark the permalink. Thanks for these great tips. 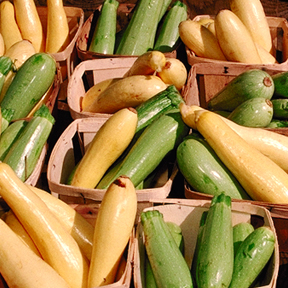 We grew squash last year for the first time with so-so results…and we planted them right next to the cucumbers. Won’t do that again! This year we’ll find some nice quiet corners. I’m so glad you liked it! Having bread cucchini myself…I know just how awful crosses between squash and cukes can be! And I love having food growing just about everywhere in my backyard. Grow on!